When I found out that there was an out of print book in The Patternist Series—Wild Seed, Mind of My Mind, Clay’s Ark, and Patternmaster—I became curious as to why Butler decided to exclude this book from the others. Finally, I got my hands on Survivor (1978), what would have been the third book of The Patternist Series. Survivor unfolds with a group of missionaries desperate to leave earth, fearful that they would be exposed to the “Clay’s Ark disease”—the disease that will turn any human into a walking zombie. While in “the new world” the missionaries become hostages to the Garkohns, the people with “fine thick alive stuff [fur] that changed color and seemed to change texture” that permitted them to “camouflage themselves” in order to spy or kill, and can only be saved by the Tehkohn people who are the Garkohn’s enemies. Surprisingly, the only difference between the Garkohns and Tehkohns is that the Tehkohns have Hao’s—high ranking blue colored beings who must be obeyed because of their favorable color. The Hao is their governing leader, their god. Although Survivor follows the formula of fantasy writing, we cannot dispose of, or even momentarily forget about the protagonist Alanna, an Afro-Asian black woman who was taken captive by the Tehkohns for two years and adopted their customs as her own. However, when Alanna is finally rescued and permitted to return to the missionary camp she is torn between the home she used to know, the customs she has adopted, and the family with an alien husband and daughter she has created. The only hope for the missionaries to live is to side with the Garkohns, who they believe are their enemies, and reject further consumption of the meklah fruit—an addictive fruit that is so addictive that trying to withdraw from it would be to commit suicide. But, by siding with the Garkohns and rejecting the fruits also means that the missionaries would have to reject their faith. I’m not completely sure why Butler decided to remove this book from the series, but it should definitely be reprinted and placed third in The Patternist Series to help bridge the gap between Mind of My Mind (1977) and Clay’s Ark (1984). I have been going crazy looking for a cheap survivor copy, i just started patternmaster and i need my sequel ready to go...so i will keep,on looking.... love..love ..ms. octavia!!!! 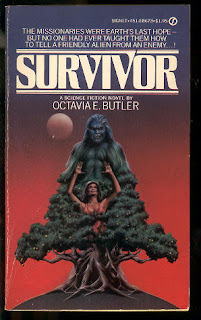 I AM READING PATTERN MASTER AND I WANT my mind of my mind and survivor, but survivor is very expensive to buy, so i will keep looking for library copies...cause i love,love,love need, need, my octavia!!!! !